Anytime you execute a Ruby application, or any language for that matter, the parser has to scan the source, split it into recognizable tokens, and construct an Abstract Syntax Tree (AST) before the instructions can be turned into executable machine code. Sometimes this is done as a separate preprocessing step (compiled languages), and sometimes it is done on the fly (dynamic languages). Now the less academic version: an AST to a program is what the DOM is to a web-page - and we all know how useful that is! In order to get access to the Ruby AST you'll either need the ParseTree, or RubyParser gem developed by Ryan Davis and Eric Hodel. Functionally, they are equivalent, but ParseTree is implemented via RubyInline (with C extensions), and RubyParser is a recent rewrite motivated by a need for a cross platform gem for JRuby, Rubinius, MRI, and others. While ParseTree has been around for more than a year, it is only recently that the community has started picking it up. Chris Wanstrath gave a great presentation (slides) at Goruco '08 about his new ParseTree powered project Ambition: "a framework for writing adapters which turn plain jane Ruby into some sort of domain specific query which can be executed". Similarly, Marc Chung gave a great talk at RubyConf '08 (slides, code), in which he talks about mapreducerb, a simple Map-Reduce implementation in Ruby, and a handful of other interesting projects. Or, maybe put some lolz into your API. 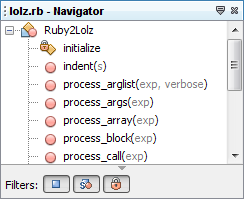 Give RubyParser a try, have some fun!